Six years ago, Drew Ferguson had a decision to make. Ferguson was an accomplished high school player at Knoxville Catholic, putting the final touches on a senior season in which he hit .392 with seven home runs, 55 runs scored, and 25 stolen bases. But he wasn't sure about playing at the next level. "I wasn't certain that I was going to play college baseball," Ferguson said. "I grew up a UT (Tennessee) sports fan - football by default - like you have to, being born in Knoxville. I cheered for their baseball program as well under Rod Delmonico. I know the family. But as my high school career wound down, I hadn't received a lot of interest. It didn't seem I was going to get a chance to play anywhere. "I wanted to make sure I went to a school that I actually liked. I didn't want to go to a junior college just to play. I was going to go to a school that I liked, and if I could play there, that's great." But Ferguson's coach, former Auburn star Adam Sullivan, saw the need for another option. "I pretty much lucked my way into Belmont. My high school coach arranged for them to come see me, and I happened to have a good game the one day they came and watched, and they offered me a preferred walk-on. In hindsight, I feel very fortunate to have pretty much just lucked my way into that situation. Not that I didn't have the ability to play at the college level… but I hadn't really put myself out there like a lot of kids do. I wasn't really bought in on playing at the next level. I'd almost burned myself out in high school." "At this point in my career, I'm all in. It's been a complete reversal." Ferguson is one of the Texas League's most dynamic players as he leads off for the Hooks. The 24-year-old is riding a seven-game hitting streak, coming off a homestand in which he posted a .423 average with nine runs, four doubles, a home run, and five RBI's. His batting average jumped .154 as Corpus Christi moved out to a circuit-best 8-4 record. Video: Ferguson belts leadoff homer for Corpus Christi. Sullivan, whom Ferguson characterizes as "very passionate and he wants greatness for his players, rather than himself," turned out to be the first catalyst for change in Drew's baseball journey. Once the young shortstop and former National Honor Society president decided to give Bruin Baseball a try rather than going to Tennessee and retiring from the game at 18, he was an infielder no more. "I was moved within a week of getting there," Ferguson recalled of his Nashville induction. "I played second early on in high school, and once the starting shortstop graduated I moved over to short. I'd never played outfield before. When I was asked to walk on at Belmont, they wanted to know if I'd ever played the outfield. I told them no, and I was expecting to go there and play infield." "I'm an infielder, I'll work my way into the lineup," Ferguson told himself. That he did, but as a three-year regular in center field and teammate of now-Hooks catcher Jamie Ritchie, also a roommate. He made 56 starts as a sophomore, batting .294 with a team-leading 16 doubles. In 2014, Ferguson hit .344, homered 10 times, and drove in 35 runs. Those numbers improved to .395/11/60 as he earned All-American recognition from the National Collegiate Baseball Writers Association (NCBWA) the next year. Ferguson ranked among the Top 15 nationally in nine offensive categories, was third in the Ohio Valley Conference in hitting at .395, had 26 stolen bases in 28 attempts, plus 26 doubles and four triples. The Astros selected him in the 19th round of the 2015 draft, as Ferguson's Belmont experience/experiment paid off handsomely. Looking back, he seems amazed at the turn of events. "I signed so late. It was in May of my senior year of high school," Ferguson said. "I went for one visit and didn't even stay the night. Just looked at the campus. It's beautiful. I decided I was going to keep playing, and they rushed me through admissions, because It was well past the deadline. I pretty much got to know Belmont as I went along." 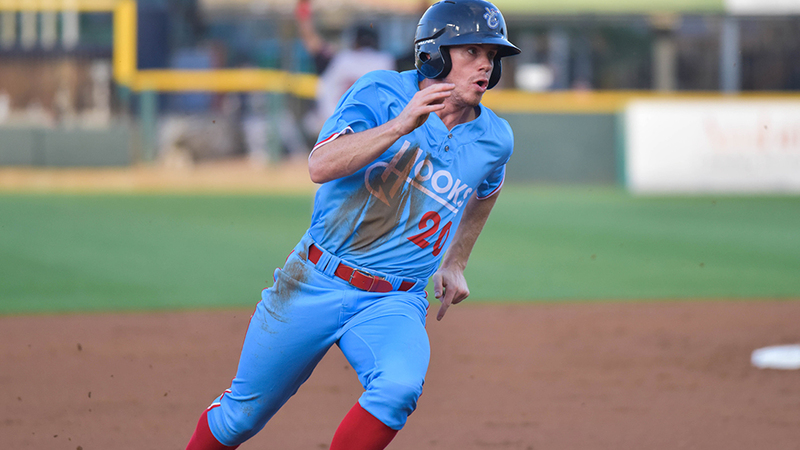 As fans throughout the Houston system have gotten to know Ferguson at four different stops - Tri-City, Quad Cities, Lancaster, and Corpus Christi - in two-plus professional seasons, they've seen a tireless team player who wants to win championships. "I'm extremely competitive," Ferguson explained. "I want to win, to be part of a winning team. For that reason, I would love to win one (championship). I haven't won a league championship in my career, so I would love to do that. It's cool knowing that you have a lot of people invested, a lot of people interested in how you're doing. That's motivation in itself. You have great turnouts here (Whataburger Field). I love playing in front of a big crowd, it gives me a little additional adrenaline, helps me focus, because you feel like if people care, if the fan base has bought in, it just makes winning a lot more gratifying. I'm all in. I'm going to do my best to contribute, and I know the rest of the guys will be doing the same." Ferguson's competitive spirit and passion for baseball go beyond the playing field and could, perhaps, one day convey to a front-office opportunity. "Development can be really interesting. The science behind it, not just swinging mechanics, throwing mechanics, or whatever, but also the overall physical and mental development of a human trying to perfect his craft, to try and master his skill." Ferguson was fascinated by a recent read, "PEAK" by Anders Ericsson. "It was about the science behind expertise, explored what changes in your brain as you develop new skills and practice certain ways, like how your own perception of your swing can influence how you're developing that skill, that sort of thing. I think that's all interesting. I kind of have the reputation in the organization among minor league players as being the most into advanced stats and analytics. I've been interested in that since I was in high school. "I was fortunate enough to graduate, get my Finance degree at Belmont… that's the benefit of being a senior sign," he joked. "That plays into my interest in stats, and numbers and finance go hand-in-hand. In baseball, finance is very important. It's not about how good somebody is, it's about how good they are relative to what they cost, and, of course, what you can afford. It's really a fascinating industry. "I think if I were to be involved in baseball after my playing career, I'd be better suited for a front-office role, rather than coaching. I don't think I have the patience to coach. But I do know, for the most part, what success in baseball looks like; measuring past success, what kind of things do you look at to hopefully predict future success. The stats, Finance degree, and playing experience are a good blend for a front-office type." A good blend can result from a near miss. You can be a little mixed up, even uncertain. But when Drew Ferguson committed to Belmont and baseball, his journey changed forever.